A Brandon University (BU) science student has earned a significant scholarship due to her project on the use of Geographic Information Systems in wildlife management. 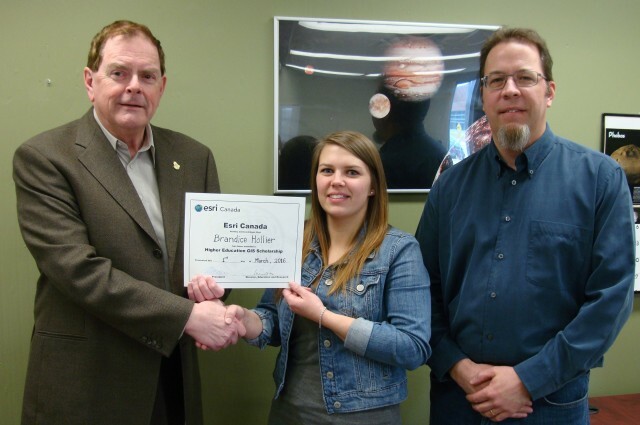 Brandice Hollier, a Geography major, received an Esri Canada GIS Scholarship in the form of a $900 cash award as well as $6,000 worth of software, textbooks and online training, and free registration for one of the company’s user conferences. GIS uses information technology to compile and analyze large amounts of geographical data and place them on maps, presenting information in a quick and easy-to-understand fashion. The technology has been adopted in a wide variety of industries and its use is rapidly growing. The Esri Canada award is based on the evaluation of papers or projects that include a significant GIS component and is intended to encourage senior undergraduate students to continue their studies in the topic. In her project, Hollier compared several GIS methods for defining and analyzing the home ranges of animals, such as elk in Riding Mountain National Park and fish in a small lake in southwestern Manitoba. Hollier expects to graduate from BU this spring with an honours Bachelor of Science degree and an Environmental Studies concentration in Geography. She has also completed all but one course toward a Geomatics concentration. Brandon University is one of the Canadian post-secondary institutions that deliver strong, multidisciplinary GIS courses and programs, to which Esri Canada provides these awards annually.